After pounding Central America yesterday and leaving 22 dead in its wake, Tropical Storm Nate has moved back over open water just north of Honduras. The warm waters of the Caribbean will provide prime conditions for strengthening and Nate will likely reach hurricane status by the weekend. Nate is currently about 230 miles south-southwest of Cozumel, Mexico and is moving north-northwest at about 15 mph. At that rate and trajectory the system will make landfall late Saturday night or early Sunday along the northern Gulf Coast between southeast Louisiana and the far western Florida panhandle. Nate will likely be a strong tropical storm or low end hurricane at that point. While Nate may not make landfall as a major hurricane, this storm should not be underestimated. Hurricane force winds, storm surge flooding and heavy rains will impact both coastal and inland areas in Nate’s path. 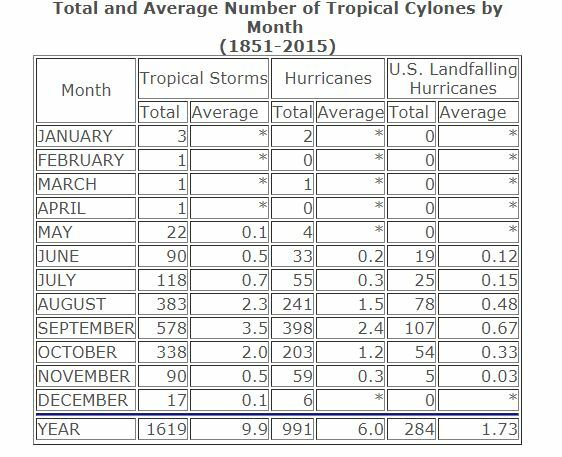 There is still a little less than two months left in the Atlantic hurricane season. While it may seem like things slow down at this point, the table below shows that October is still a very busy month for hurricanes. Some of the more notable landfalling hurricanes from this month include; Opal- 1995, Wilma- 2004, Sandy- 2012 and Matthew in 2016. Historically, Florida is most likely to see hurricane landfall in October- especially southern Florida. There have been 17 major hurricanes to make October landfall in the U.S., 10 of which occurred in Florida. It goes without saying, we must remain vigilant during this time. Hurricane season is far from over!